The Eagles went into last week’s bye with the best straight-up record in the NFL at 8-1. Without playing a game, they widened their lead in the NFC East last week when the other three teams in the division went down in defeat. 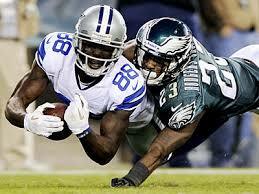 Philadelphia is a profitable 7-2 against the spread and the total has gone OVER in six of its first nine games. It is 3-1 ATS this season on the road and 5-1 ATS when closing as a favorite. It has been the Carson Wentz show for the Eagles this season with the second-year quarterback lighting things up through the air. He has thrown for 2,262 yards and 23 touchdowns against just five interceptions. The ground game led by LeGarrette Blount has done its part as well with an average of 136.8 rushing yards per game. On the other side of the ball, Philadelphia is ranked 10th in the NFL in yards allowed and first against the run. Dallas could find itself a full four games off the pace in the division title race with a loss on Sunday night after getting beat by Atlanta last Sunday 27-7 as a 3.5-point road underdog. The Cowboys are now 5-4 on the year both SU and ATS, The total stayed UNDER in their last two games after going OVER the closing line in their previous four contests. They have gone an even 2-2 ATS this season in their first four home games. In the Cowboys’ first test without the services of running back Ezekiel Elliott, they posted 107 yards on the ground against Atlanta as opposed to a season average of 143.6 rushing yards, which was the second-highest total in the league. Dak Prescott took a beating in that game with eight sacks while only connecting on 20 of his passing attempts for 176 yards. Dallas did keep Falcons’ quarterback Matt Ryan in check on defense, but it allowed 132 yards on the ground.